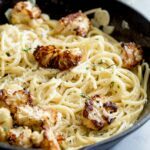 This Roasted Cauliflower with Creamy Garlic Pasta is an elegant yet simple vegetarian pasta dinner. Perfect for entertaining or dinners on meatless Monday. The cream and garlic come together to make a creamy dreamy sauce that is pure comfort food, whilst the roast cauliflower gives some texture to the pasta. This really is a delicious vegetarian dinner. Roasting cauliflower in the oven turns something plain into something super special. The edges caramelize, the flavour sweetens and the texture is beautifully yielding without a hint of soggy. Roasted Cauliflower will please vegetarians and carnivores alike. Remove the outer leaves of the cauliflower then cut the florets into large bite sized chunks. Lay the cauliflower out in a single layer on the prepared tray. Drizzle extra virgin olive oil over the cauliflower. Season everything generously with salt and pepper. Roast in the oven for 25 minutes until tender and caramelized on the edges. 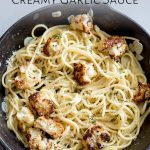 The creamy garlic sauce comes together so quickly, you can easily make it whilst the pasta is cooking. Plus there is only 2/3 cup of cream for 4 people!!! With a couple of tricks you can have decadent and elegant creamy pasta without the excessive calories. And this doesn’t mean we are skimping on sauce! This sauce coats each strand of pasta with a silky creamy sauce perfectly. 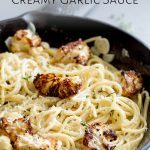 How to make the sauce without using a ton of cream?? The key is the starchy pasta cooking water. It thickens the sauce, makes the cream go further and gives it the amazing ability to coat the pasta. Start by cooking the pasta for a little less than the packet suggests, this is because it is going to finish cooking in the creamy garlic sauce. Then before you drain the pasta reserve 2 cups of the water. 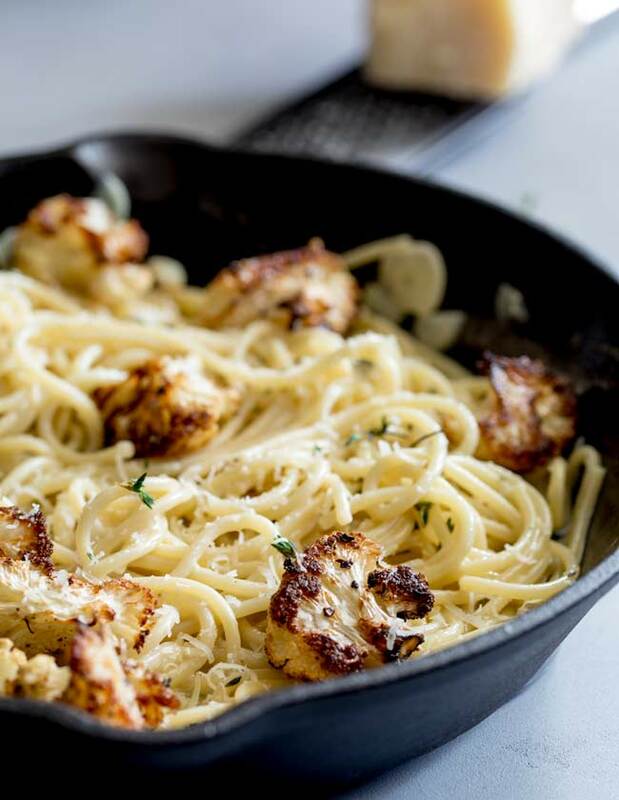 This water gets used to thin the cream sauce and then the pasta is added back in and everything just comes together into a big skillet of deliciousness! Which pasta shape to use? For the photos I used a thick spaghetti, but you could go with a linguine or tagliatelle. I know not everyone is like me and doesn’t mind slurping and swirling pasta and then getting hot cream sauce on their chin 😉 so if you love short pasta then go for something flat like a farfalle/bow-tie pasta. Avoid tubular pasta or shells as they will fill up with the creamy sauce and you might find there isn’t enough sauce to coat everything beautifully. Side: Swerve the bread and instead go for a crisp bright salad to balance the creamy sauce. Dress baby kale leaves with a lemon and olive oil dressing. To cut through the creamy sauce pick an unoaked chardonnay or a dry pinot gris. For the red wine lovers something light like a Barbera d’Asti or a Merlot will work with the garlic and cream. 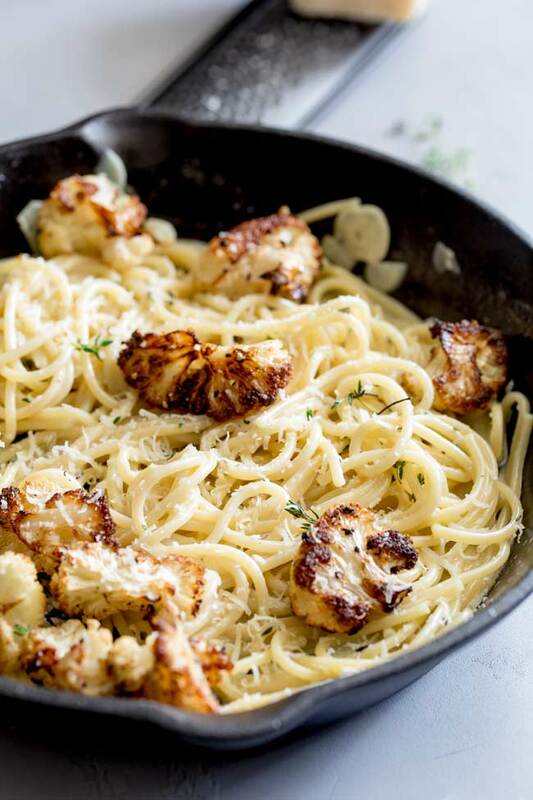 Why not pin this recipe for Roasted Cauliflower Pasta with Creamy Garlic Sauce. Pin it here. Preheat you oven to 400º F/200ºC. Remove the outer leaves of the cauliflower and cut the florets into large bite sized chunks. Lay the cauliflower out in a single layer and drizzle over the extra virgin olive oil. Season the cauliflower generously with salt and pepper and roast in the oven for 25 minutes until tender and caramelized on the edges. Remove from the oven and set aside until needed. Bring a large pot of water to boil and then add a good amount of salt. Heat the butter and olive oil in a deep skillet over low heat. Add the garlic slices and sauté for 2 minutes (don’t let them colour). Add in the thyme leaves, salt and pepper, then turn heat down to low and simmer for 3 minutes. Before draining the pasta, scoop out 2 cups of cooking water and keep to one side. After reserving the cooking water drain the pasta in a colander. Transfer the pasta and 1/2 cup of reserved pasta water into the pan with the sauce. Place it over a medium heat and gently turn the pasta in the sauce to create a silky coating on each strand. Add more cooking water if needed. Stir in the roasted cauliflower and serve with grated parmesan and thyme leaves. 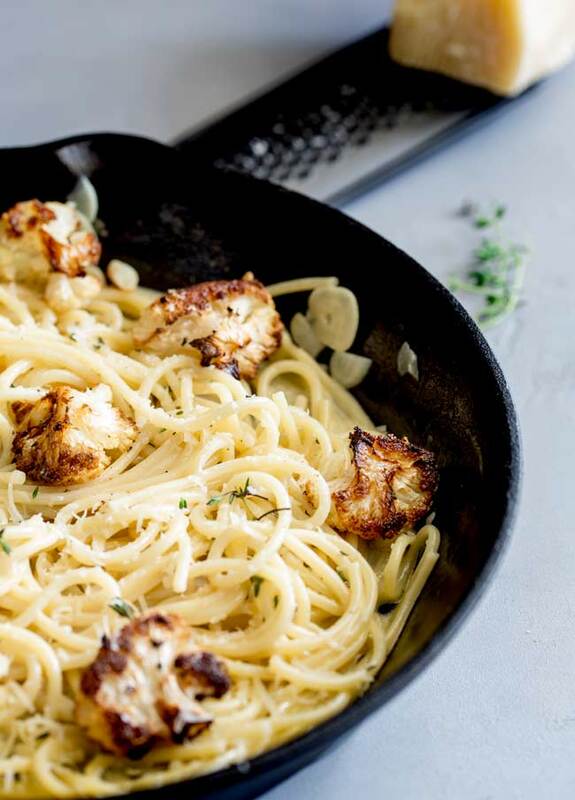 If you love food why not subscribe to my newsletter, I will drop you an email every now and then, just to say hi and send you a couple of recipes I think you might love, like this Roasted Cauliflower Pasta with Creamy Garlic Sauce. 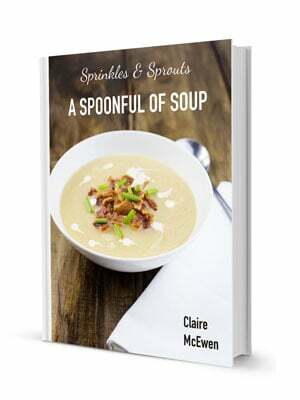 Yummy, delicious & easy to make . 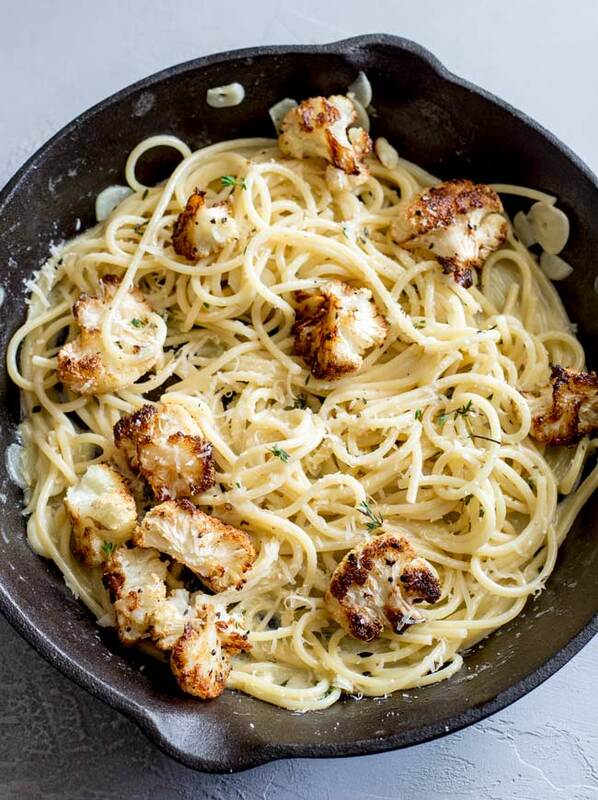 This Roasted Cauliflower with Creamy Garlic Pasta is Very Nice. Best startup Business In Indore. Eating a 2nd dinner, because the first was so good. yum! So please you loved it! Great suggestions for the wine, wish everybody would do that! We went wine shopping for a “romantic evening” we had last week, and being there noticed neither me nor my husband knows anything about wine! It is something I am slowly introducing on my posts as I get friends asking me what wine they should choose for the dish and I thought perhaps my readers would too.